Homeowners and residential purchasers of are a lot more demanding about the exterior and interior look of their steel buildings than those looking for working buildings. As a result for many of the residential steel buildings Blueriver provides, we use external cladding that looks more natural or organic. 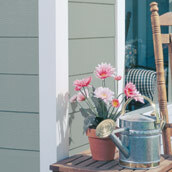 For instance the exciting 'Eternit Weatherboard' product range. This provides a traditional wood-clad looking building, but based around the same steel-frame interior, giving excellent looks for the residential market while still delivering a low maintenance external skin. This makes an excellent option for projects such as summerhouses, beach huts, pool houses or other buildings where look is as important as functionality. 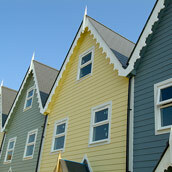 As well as being available in most builders merchants throughout the UK, Blueriver can price your building dimensions using Eternit Cladding or alternatives such as James Hardie plank. Blueriver Steel will supply the whole building kit for your assembly or by one or our qualified team including internal and external finishing. Not every project is looking for a large building as a solution. In this case we had a limited amount of space to work with, but wanted the maximum storage space possible. Steel frames with a simply green metal cladding was the solution. Steel buildings don't have to be large to be useful. In a residential setting our steel buidings get used for a huge variety of annexes and outbuildings, starting with a step up from traditional garden sheds for larger houses and estates, or as storage areas for hobbies like sailing, cars or flying, or for professional animal breeders requiring space and security.